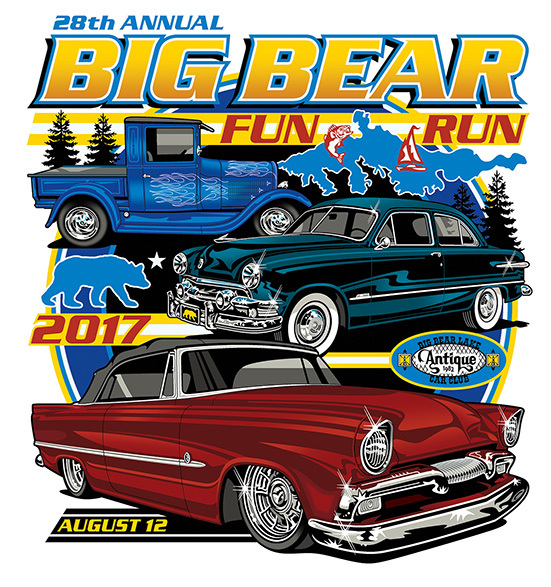 28th Annual Fun Run, August 11th, 12th, 13th 2017 has passed again! Thanks to all in attendance; another fantastic Fun Run! 8:00 AM to 5:00 PM - Check-in at the registration booth in Bartlett Lot. Visit our beautiful valley; see the Zoo and the Museum. 7:30 AM - Gates open for show cars to enter, locate your pre-assigned parking space, and shine them up. 8:00 to 9:00 AM – Registration for late arrival parking spaces located at the Bartlett Parking Lot. 9:00 to 9:30 AM - Resell unfilled parking spaces in the Bartlett Parking Lot. 10:00 AM to 12:00 PM - The "judges" will be out and around looking to pick our award winners. 12:00 PM - Judges turn in their results. At about 2:30 PM, the award winners will be posted and notification sheets handed out. 3:00 PM - Draw and announce the winner of the 50-50 raffle prize. Winner must be present. 3:45 PM – (This time is FIRM) The west gate will open for the "Cruise around the Lake." This is a special feature of our show as many people will be lining the roads waiting to see and hear your car with enthusiastic waves. This cruise will take about 30 minutes. It will go west on Hwy. 18 for about 4 miles, across the dam, east on Hwy. 38, through Fawnskin, for about 5 miles, right onto North Shore Lane to Stanfield Cutoff where the cruise is over. 5:00 PM - Return the streets and Bartlett lot to normal traffic. 7:00 AM - Gates open for our "Awards Ceremony." Award winners must line up in their pre-assigned positions. 9:00 AM - The Awards Ceremony where you will see and hear the finest cars in our show. This ceremony generally lasts about an hour. Engine Drawing follows the Awards Ceremony. Winner need not be present.